Is it a Blanket or a Quilt? I drive by this everyday when I go to work. I cringe when I think it might be a quilt that somebody made; that somebody put their heart into. I snapped a photo and then started wondering if it could be a blanket made to look like a patchwork quilt. That's what I think I'll tell myself. I've seen a few bloggers who are snapping photos of their design wall on Mondays. I'm enjoying seeing what's hanging in other quilter's sewing room so I thought I'd share today. Hmmmm, looks like a lot of little quilts going on in my room! I've talked about the basket block and snowball just recently. They haven't moved from this spot since then! The little applique blocks to the left were 4 little blocks I found while cleaning, so I whipped up a little sash and made a mini 4 block quilt. Does that funky green and pink center block look familiar? That was in my crumb pile now destined to be a scrappy little medallion. I'm so glad I didn't throw it out. So, that's on my wall this week. What's on your design wall? This is Patch strutting her stuff in the ring. That's my cousin on the other end of the leash. Here is Patch and Griz. Despite their appearance they are babies and so lovable. Here's Griz, all 50 pounds of him standing on my foot! Here is Griz at Rally. He didn't do very good. The next three photos are random shots I took. Enjoy! Hmmmmm, did anybody think twice about my spelling of memento yesterday? Normally I wouldn't give this a post of its own, but I have a little history with this word! While typing up my post the spell checker corrected my spelling of momento and wanted to change it to memento. So, I brought out the Merriam-Webster. momento- not in my dictionary at all. I looked online and found that the words can be used interchangeably, but memento is actually the correct spelling. While in Europe we saw so many paintings that had skulls. In churches, paintings of ministers with these awful skeleton heads, usually setting on a table with the minister's hand on it. We also saw a lot of carved skulls. We saw it again and again and I had to find out what the meaning of those skulls were. Memento Mori- Remember you are a man and you shall die. It was a reminder, especially for the religious, that death would come, no matter how important they were on earth. I hope you found that interesting:) I wouldn't have posted this but it is Saturday. I made this little quilt as a memento for our Danish friends who are coming in a few weeks. They have been to the US but not to our town or home. I'm hoping this will be a little reminder for the mom when she is back in Denmark of the good time they spent with us. I wasn't sure how much room or weight their luggage would be so I made sure to make it small- about 14" square. I have never been a good paper piecer. You'd think after doing the Stickle quilt and Salinda Rupp quilt that I'd have it down. This isn't meant to be a paper piecing tutorial but to show you how one small thing has helped me so much. I had the opportunity to do some paper piecing over the weekend and thought if I could help one person then that would be a good thing! I was always holding my paper up to the light to see where the next piece goes. I'd pin, then flip it and check to make sure I had a seam allowance and that my fabric covered the whole section it was supposed to. If I didn't have enough light then I wouldn't be paper piecing! When I had weird angles that was a whole 'nother scenario. Someone got me this ruler and although the ruler is handy, the best pp tip for me came from the directions inside the package! By the time I thought I'd take photos this is what I had. I sewed on the line on the other side of the paper. I trimmed the seam, then pressed. Now this might be fairly easy to see where to put the next piece of fabric, but for the sake of this post I'm going to show you how I did it. Turn the paper over so you can see your sewing lines. Fold back your paper against the index card. Use your add a quarter ruler and use the little edge against your card. Set your next piece on top of the fabric and you are ready to sew. No holding up to the light! I did the same thing on the sides. Put your index card on the sewing line and fold back. I really wanted a seam that was a bit smaller then 1/4" so I used my regular ruler. That works just fine. Until I read about folding back the paper on an index card I fought with paper piecing. This tiny, easy trick has helped me immensely! Now, please don't tell me you've been doing this for years, OK?! I don't have photos of all the completed RR, but you don't need the whole quilt to see the creativity of this bunch of ladies! Ruthie lives on an island off the coast of Maine. She loves lobsters! Patty IS the lady in the center! She oozes creativity and is happy at life!! The two below were done with a different group of ladies. We wanted to keep them small so that was the only criteria. I love my Lady Liberty RR so I thought I'd show it again. She is hanging in my entrance way to herald in our Independence Day!! I know I have shown you my Round Robin but I didn't think to show you the other participants. 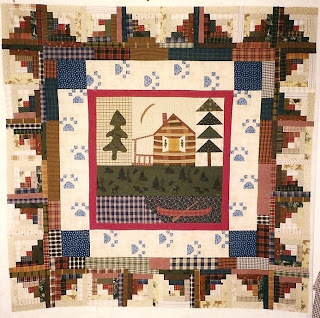 The appliqued log cabin was the center of the block. My addition was the log cabin squares. This is how it looked when I sent off for the next round. This was Jill's completed quilt! Isn't is amazing!? The center block was the compass square. This was how it looked when I sent it off. Here was the three tops that made it to a get together we had. It was the unveiling and we were all overwhelmed with the beauty and workmanship of them. For those of you that know I am a Weight Watcher leader, I'm in the center pre-WW days! Here was my attempt to hand applique these tiny pieces. It just wasn't working for me at all. Here is my machine appliqued block and although it isn't perfect I sure like it better. So much for my summer "hand" project! As long as the weather stays cool I'll keep plugging away at hand quilting my DJ quilt. P.S. Someone left a comment about the starch method. You were on "no reply" so I could not contact you and let you know I'd like to know more about it. I thought I would load another photo so we wouldn't have to continue to see the snake in a bucket! Last fall my sister and I took my mom on a short road trip to visit her sister. Just a short ways off the road was the old home and ranch my grandmother used to live so we took a bit of a detour to see it. As a kid I don't remember it being this beautiful! We didn't make it to Grandma's often and what I remember was a big box of comic books and my grandma's "paint" room. (and the bulls, as I was a city kid from Seattle) Now that I'm an adult I realize she did many more crafts then just painting. Her embroidery and crochet are just perfect. The Memory Bouquet quilt blocks are patterns I found with her things. After she widowed she moved closer to my town, but never did realize how creative and talented she was until after her death. I have very fond memories of my Grandmother and I'm named after her- Loretta Rose, to be precise. This dangerous fellow made his way in my backyard this week! He was rattling his tail at my dog, thankfully, he heeded the warning. If I hadn't come outside I'm not sure how long he would have though. I called hubby and my son was on his way home and they scooped it into this bucket with a rake and dropped him far from my address! You can click to enlarge. I've made my way through a few quilt tops. In April I posted here about the tops I wanted to get done. I mailed the last 2 off to my friend and machine quilter Kathy this week! Woo-hoo! While she has them I'll get the binding and labels made. 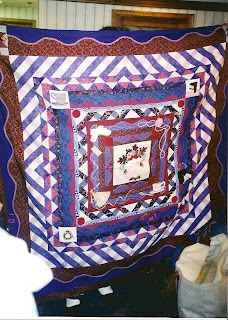 The photo shown above is one of the quilts I mailed to her. I have quite a bit of company coming beginning the end of June through the end of July so I will not be posting as often. Janet at Quiltsalott mentioned her stacks of quilts. 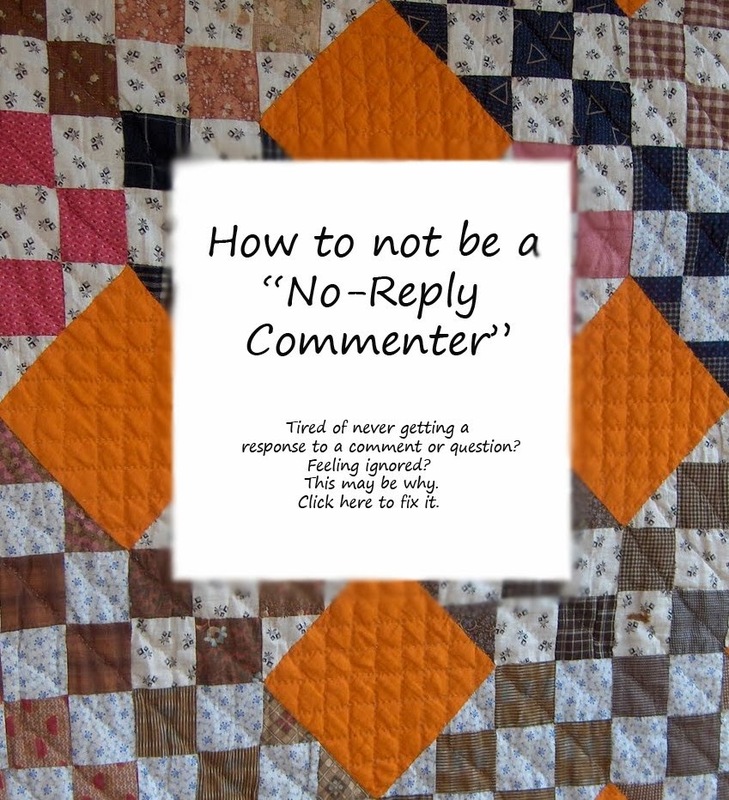 When people visit there is no doubt I am a quilter. My quilts are pretty much spread out all over the house, over chairs, on walls, on racks and on beds. Here are just a few in my bedroom. The rack is nothing fancy but I love it. I saw an article on Jan Patek in a magazine and she had something similar, so I had my brother make this for me. 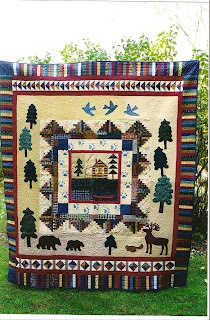 I'd like to see how you display some of your quilts. 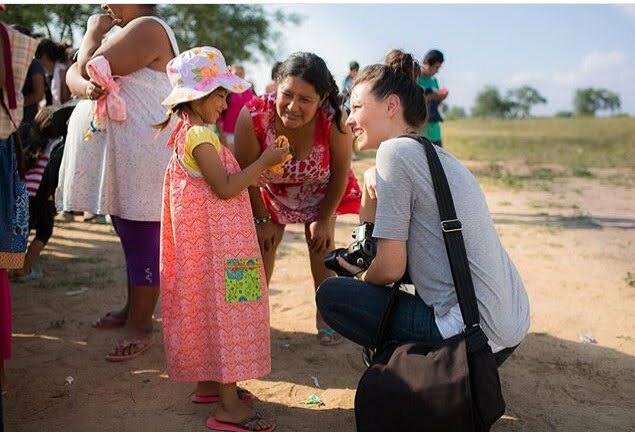 Maybe you could take some time this week to take a few photos and post them on your blog. Or if you don't have a blog send them me and I will post your photos on my blog. What do you think? I've been digging through and cleaning out a few areas of my sewing room that needed attention. I mentioned last week "crumbs"; those bits and pieces of blocks that seem to multiply as fast as my scraps. Where did these come from?! 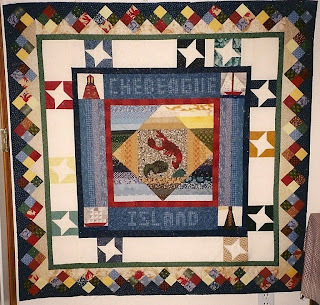 I recognize a few, like the flying geese strips from the RR Crossing quilt and a Rupp block that I obviously didn't have the colors figured out. (it is still pretty cute though huh?) but I really think someone snuck in here at night and dropped of the drunkards path blocks and about a hundred HST in all sizes. I'm not sure if the plan is still to work on these over Sisters week or not, but I am determined to do something with them. Aren't you glad I didn't have a drawing for these? Ha, I'd probably have a negative reader amount!! Actually I feel like the winner! 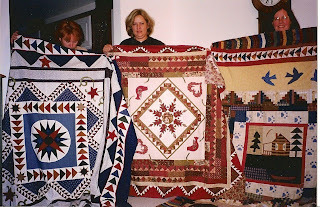 I've had a lot of fun checking out new-to-me blogs and having a quilt show right in my own home! How cool is that?! I really appreciate your comments and your visits to my little blog on the web. Please contact me at Loridweightwatchers(at)gmail(dot)com with your address and I'll get the package out to you right away. My DJ online group saw this quilt in a book (New Discoveries in American Quilts by Robert Bishop) and decided we wanted to make it. Ruthie and Paula are pretty much EQ whizzes and love a challenge. They designed these blocks by looking at the book, figuring out the math, and drawing them in Electric Quilt. They had the hard part the rest of us had the easy part! Ha! Did I say easy? While we were piecing the quilt Lois published Nearly Insane. If you have never heard of this quilt then do a google search. The original was made in Lancaster Co., PA c. 1870 by Salinda W. Rupp. The name of my quilt is Pennsylvania Plenty. BTW, this is a great book if you love old quilts. It is available used on Amazon for a very reasonable price. There is still time to join in on the giveaway! Make a comment on yesterdays post and you'll be entered. OK, I see a lot of bloggers doing this so I thought I'd jump on the giveaway bandwagon. This is actually my 101st post but I noticed Friday's was number 100! Just remember one woman's (or man's) junk is another one's treasure. I'm not saying it is all junk, but it is something I no longer want in my closet. With the help of my brother and sister we just moved my mom from a 3 bd home that she has been in for 18 years to a 1 bd apartment. It reminded me to clean the clutter from my house so nobody will have to roll their eyes at my collections of stuff! 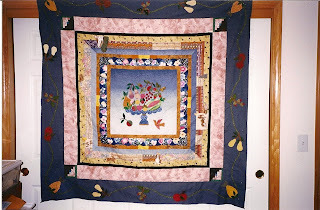 Several years ago I ordered a BOM pattern from The Quilted Garden. (can't find them online any longer) It was Botanika by Robyn Pandolph- very beautiful. It could be elegant or you could make it more loose and primitive. I did 2 blocks, prepped a 3rd and now I would like it gone. 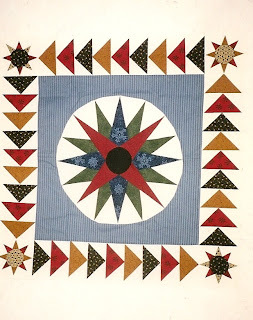 If you do a google search for Robyn Pandolph Botanika quilt you will see the whole quilt as she did it. I also see a few shops still offering it as a BOM. 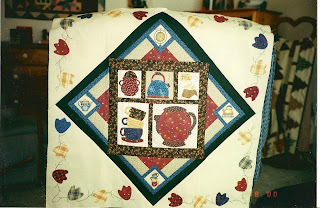 What you will win: 2 completed appliqued blocks, 1 blocked pinned and pieces cut out, 12 patterns by Robyn Pandolph. These blocks finish at 20". Feel free to comment even if you don't want the patterns or blocks, just let me know. Cut off time will be Tuesday night 9PM Pacific time. I'll post the winner on Wednesday.